We are all familiar with the words “I’m in love with the SHAPE of YOU” which are the lyrics to the recent release by Mr. Ed. Sheeran. But do we really know what shape our bodies are and do we know how to dress for our body shape. 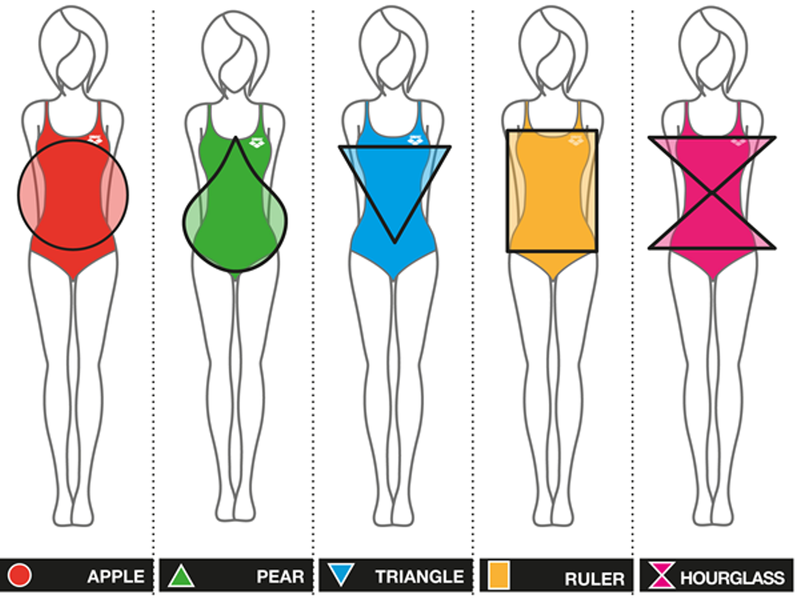 The female body falls into one of five categories: Pear, Apple, Triangle, Ruler and Hourglass. Which one are you? Apple : Apple shapes gain weight in the midsection, rear, and face. These figures usually have a large upper body, complete with large shoulders, bust, and waist. The hips are slim and the legs are slender. Pear: Pear shapes usually gain weight in the rear or thighs. These women have wider hips and thighs, but usually have a small bust and waist. Many pear shapes have hips that measure wider than their shoulders. Some also have short, full legs, but slender arms. Triangle: The inverted triangle shape gains weight around the shoulders and bust. These women have a full upper body with broad shoulders and a large bust. The waist is flat and the hips are narrower than the bust and shoulders. Ruler: For ruler shapes extra weight gathers around the stomach and back regions. The waist, hips, shoulders, and bust are usually slim and fairly equal in size. Hourglass: Hourglass shapes gain weight proportionally in the hips, thighs, and chest. The bust and hips are similar in proportion, and the waist is very narrow, creating noticeable curves. Now that you know the five shapes which one are you most similar to? Determining your body shape is often the first step in learning how to dress in a way that makes your body look its best. Nearly every woman has areas she would like to cover, as well as features she would like to show off. Knowing your shape allows you the opportunity to gain a better understanding of what these areas are. A lot of women buy clothes that don’t fit them properly and then end up spending more money on having it adjusted to fit properly. It is great if you know your shape before you go shopping because then you would be more likely to look for items that would look better on you, rather than picking an item that you like but doesn’t suit your shape. The shape of all our bodies will change a lot over the years but the key is understanding what styles suit your body and then finding clothes that fit properly. Dont get caught up on the size of your clothes. The size is just a number and varies from retailer to retailer. It’s important that shape is the main consideration when choosing items for your wardrobe. My body shape is most definitely pear shape. I tend to carry my weight around my hips, bottom and thighs and be smaller up top with a flat tummy most of the time. The majority of women are pear shape. Studys show that a womans body is likely to evolve into pear shape as she matures. Wear bold bright tops. This will draw attention to the upper half of your body. I love layers, so try to layer your top half, which again, will draw the eye upwards. Kimono and bell sleeve tops really flatter pear shaped figures and are really in fashion now so you can find many of these at very low prices. Try adding shrugs and gilets to a plain top over jeans. I love to wear blazers over jeans and these can look very stylish for going out to dinner or over trousers for work. So now that you know your shape enjoy treating yourself to styles and fashion that suit your shape and continue to enjoy shopping😂.